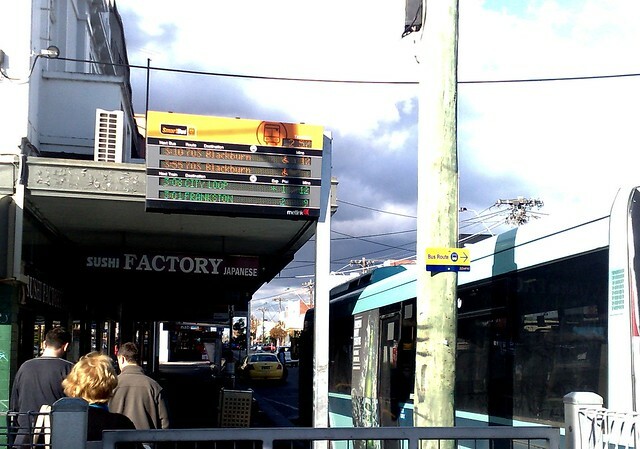 There used to be realtime train information displayed on the Smartbus sign outside Bentleigh station (as there is at many other Smartbus stops near railway stations around Melbourne). The information was provided partly for the benefit of bus drivers, so they could see if a train was imminent, and if so wait for passengers (though it was never clear if they’d been instructed to wait a bit longer if they were due to depart). But of course, the information was useful to the general public as well — the countdown timer was a prompt you might need to walk faster to catch your train… and it’d be good advertising for the frequent (ten minutes or better) we now get every day on the Frankston line. 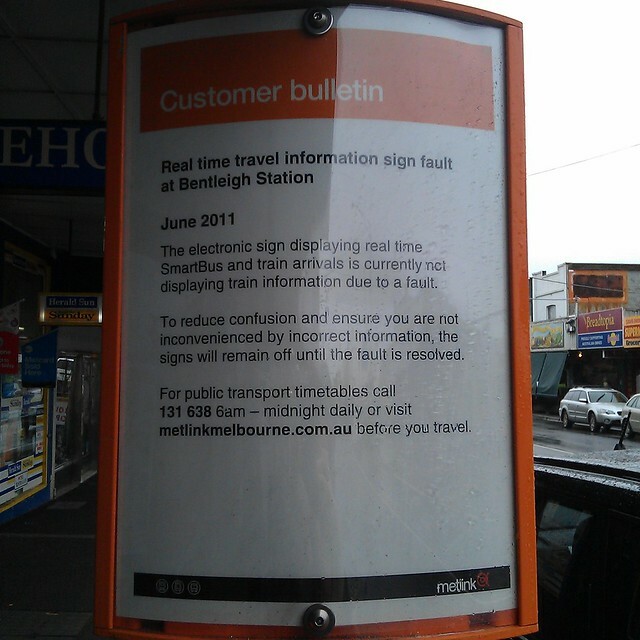 About a year and a half ago in February 2011, around the time of the last fatal accident at Bentleigh station’s level crossing, the train information on the sign was turned-off. Last year it was also the case that some other similar signs elsewhere in Melbourne didn’t properly work, though others continue to work fine. It was switched-off because the Department of Transport believed the information on it was sometimes wrong (though I don’t actually recall spotting any glaring errors on it). A notice was placed at the stop explaining why. Just in the past few weeks, there’s finally been progress. What progress, you ask? A new notice! With the Metlink logo replaced by a PTV logo! Hooray! In all seriousness, I’ve checked — they’re still working on a solution, but they don’t want to use the old apparently dodgy data feed (I think it may have been provided by insane monkeys hidden away in some basement underneath Flinders Street, pressing and listening to green buttons before bashing the information into keyboards to display on the screen). Instead they’re going to switch to a shiny new rocket-powered, laser-guided data feed that apparently also feeds the information provided on the platforms — in this case, the green button, I guess. And there’ll be another improvement: it used to be that after the last bus had gone, the entire sign switched itself off, even though trains keep running for several hours afterwards each night. I’m told that when the sign is working again, the train times will still be displayed when buses have finished for the night. When this will all happen, however, is unclear. And it looks like the little boy in the second photograph has got so tired of waiting for the problem to be fixed that he’s fallen asleep. I use Essendon Station and the 903 Smart bus has a stop there. Frequently the real time display doesn’t work in some way. Some times its just like a few segements have dropped out and sometimes the whole thing is blank. However the interesting bit is that even when it is working, the train information on the street display differs by 2 minutes from the similar display on the station platform. So I know when approaching the station, that if the sign says 1 minutes for a loop train, then I have 3 minutes and so I don’t have to run. This implies there are two sources for the ‘real-time’ info which is just crazy.! 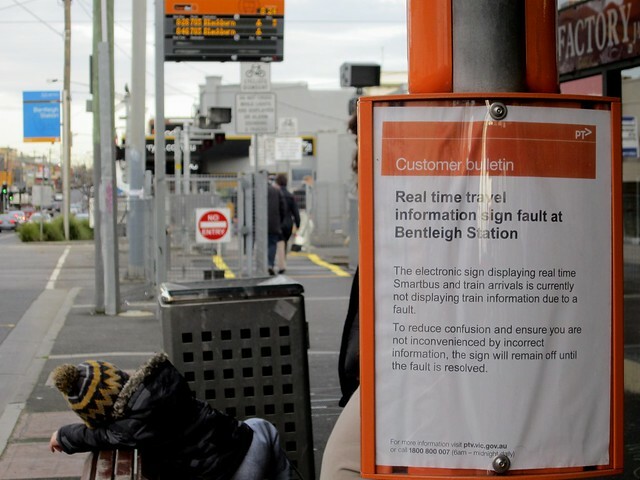 I wonder if its really the same issues as yours at Bentleigh. Also I travel sometimes along Bell St where the 903 runs and in peak traffic the ‘real-time’ signs appear to just display the timetable info. I frequently see a situation where the time to next bus is given as ‘now’, but there is no bus in sight in either direction.! My opinion is that this whole business of “real-time” information is a case of biting off more than you can chew. When the system is working normally, it is easy and unnecessary. And where there are delays, it is impossible for them to make it right. If there is an accident down the road which blocks the main road for 20 minutes, how is some numpty in the basement of flinders street going to know ? Even the traffic cop on the scene doesn’t know, and he is too busy to keep the numpty informed any way. Basic timetable information should be at every bus stop, along with a list of the route or routes, and where they go. Either actual times or frequency information. The idea that everybody is going to be carrying around an internet-capable device to look it up all the time is nonsense. @enno – The technology may get fooled sometimes, but it’s a lot more reliable than static information. The trams for example trigger updates across the network as they pass certain points, no basement numptys needed. I’m guessing that it is exactly the same for buses. If the tram gets delayed between Point A and Point B by 10 minutes, it might not be useful for the people waiting at Point B but its useful for everyone at stop C, D, etc. Secondly, Daniel’s post is about real-time information displaying at stops, not internet connected devices. However both are useful, at stops its good to be able to know if you’ve got time to quickly buy something at a nearby shop, or use a public toilet, etc. It’s also just less frustrating than having no idea how late a service is running (or if its running at all). For devices you can decide to rush to the stop or take your time, etc. Some of us don’t even get station displays telling us when the next train is coming, let alone displays outside in the street (in my case, Jewell Station). Are there any plans afoot to put next-train displays on all station platforms? Really, you think that anybody knows where all the buses are ? You think there is some big network of sensors and transponders which does this ? I doubt it. @enno – All trams and smart buses are GPS equipped. So information presented on the passenger information displays and tram tracker app are accurate the majority of the time. To do that, requires not just a GPS receiver, but also some means for the vehicle to transmit its location to some other network. Its amazing how many people ( not necessarily you ) believe that having a GPS device will transmit your location to the satellite or the CIA or somebody. Its not the case, GPS is strictly a one-way transmission from the satellite to you. Being “GPS equipped” is not sufficient to enable a real-time passenger information network. Apparently it doesn’t even enable charging the correct fares. GPS equipment was fitted as part of the Myki rollout. It has already been publicly stated that realtime tracking of buses (and trains) will be provided. COMMUTERS will soon be able to track the exact location of every train, bus and tram in Melbourne via GPS technology on their smartphone or iPad. Real time information for trams will be available at launch, with trains and buses to be added in coming months. @Paul, re: realtime displays at stations, they appear to be standard for new stations, such as Lynbrook, but it’s not clear if they’ll be retrofitted to older stations. Like SMS? GPS transponders aren’t exactly rare, difficult, or expensive technology. Certainly easier and cheaper than paying staff to sit in basements trying to keep track of everything manually. Smart buses and trams on routes with real-time information are certainly already equipped (all the tram network by now surely?). They’re not necessary on trains because the signalling system has already been telling network operators where the trains are for a long time. And I’m guessing that the Myki consoles fitted to even the old stupid bus probably included the technology as well, but supposedly they still haven’t been switched on to full functionality because the consoles don’t play well with Metcards. I see what your saying Daniel and from all the times I have seen a bentleigh bus, it had been an old blue one of Ventura, they don’t have all the new bits the smart buses have, some not even flatbfloors or air conditioning. Even outside oakeigj depot the time sign was horribly wrong. Drivers wait to do changeovers there and knowing what time bus is due they see the screen is way out by 10ins but they fixed tjqt quick.